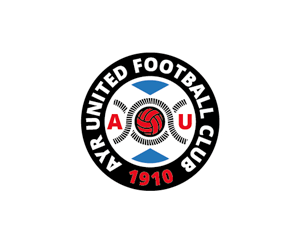 Ayr United FC announced a competition in January 2017 to decide their new badge. 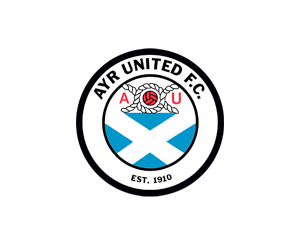 The reasons they’re being forced to change their badge are covered in my Ayr United badge redesign and Banned badges posts. There seem to be a lot of misunderstandings about the design issues. Not only from fans but newspapers and the club too. Bearing that in mind, I thought some visual examples might help. Also, pointing out how some designs have avoided the pitfalls while others didn’t. These designs were all on public sites so I’ve collected them together (under ‘fair use’ in copyright law). If any of their owners object, or want to submit something else, just let me know. I’ll try to be more constructive than some comments I’ve seen about screenshots of my designs! Pedigree: Experienced but new to this course. Form: Mixed – praise, resistance and polite disagreement here and elsewhere. Also, the usual one-word critics on forums and social media. Fitness test: Passed – not an enclosed shape so not heraldic. Odds: Outsider – refusing the start gate. The club’s post says the competition is aimed at Ayr fans and they’ll ask primary school children to ‘design’ it. Hasn’t worked in my experience – someone always has to tidy up after the weans. Pedigree: Fan’s quick response for a ‘European-style’ badge. Form: Decent, despite “football club” going head over heels. Fitness test: Failed – has name inside shield. A shield can be any enclosed shape – as the Lord Lyon’s staff told Airdrieonians. Steward’s Enquiry: The Lord Lyon did tell Airdrie a shield could be any shape but seem to have told Ayr a circle is an exception. Also, this one has a very similar heraldic description to Queen’s Park FC’s badge. The ‘blazon’ includes ‘a barry of sable and argent’ (means black & white horizontal stripes). Again, shape doesn’t matter – it’s about the description. Anyway, happy 150th Queen’s Park – mind those candles! Odds: Lay – causes as many problems as it solves. Pedigree: Good – nice illustrative style but composition is a bit empty. 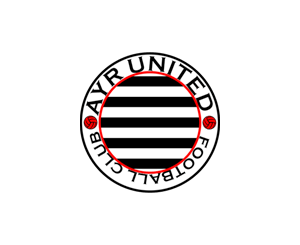 Form: Limited – seen briefly on Ayr Utd forum. Fitness test: Passed – enclosed shape but steeple is religious building, so not covered by heraldry, and Ailsa Craig can’t be accurately described. Odds: Drifting – definitely Ayrshire but not the whole picture. Pedigree: Chum? Sorry, couldn’t resist. You can see the effect Cammy’s driving at but software is not co-operating. Fitness test: Passed – not enclosed and black saltire isn’t national flag. Odds: Long – but not the only one to go for black saltire. Pedigree: Fan putting current badge into new shape – seems to tick all the boxes. Odds: Non-runner – unless the outlines are opened up, it could be a coupon buster. Pedigree: Top notch… for literature! You knew Rab had to be in here somewhere. Refreshing to see old Ayr FC colours. Form: All or nothing – Rabbie would probably approve. Fitness test: Passed – open shape isn’t heraldic (neither is Burns). Odds: Not too rosy – might be more popular with public than fans. Form: A few decent showings. Fitness test: Passed – no shield so not heraldic. Scroll doesn’t matter (despite club saying to avoid it). 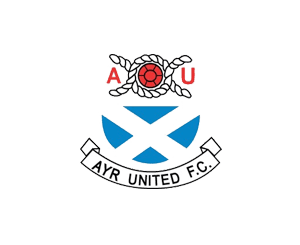 Odds: Evens – copying tried and tested example but that example is Airdrie! Pedigree: Very good – using rope to suggest a saltire, without actually including one, was an inspired move. German-style surround is sharp (based on St Pauli?). A real shame it falls at final hurdle with heraldry laws. Form: Coming up on the rails. Fitness test: Failed – enclosed shape with letters inside. A heraldic shield can be any shape including a circle (think Braveheart). 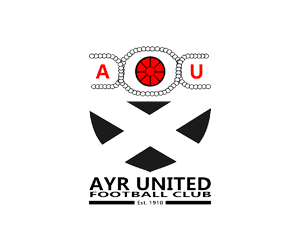 So, this fails for same reason as current Ayr badge. 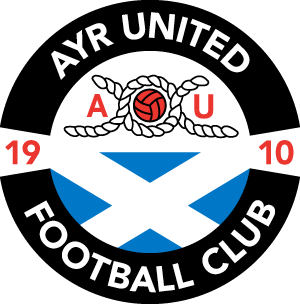 Steward’s Enquiry: again, Ayr seem to have been told a circle is okay, despite the circular Scottish ‘targe’ shield (as seen in Braveheart). There’s a serious point in amongst all the horse racing metaphors. Some of these designs have potential to be a new club badge but I think they may need adjusted to avoid falling foul of the Lord Lyon (which is the whole point of the competition). It’s constructive criticism to try and help their chances (but they don’t have to act on it). These designs are just a snapshot from what I’ve found on the web. I’m sure there are plenty of others doing the rounds. 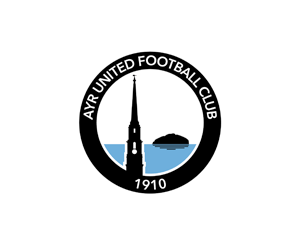 Ayr Utd have gone down the schoolkids competition route so all bets are off about what they’ll end up with. I get that it would be a nice PR story if some wean did win it. If they do, and their design ticks all the boxes, that’s great (I’m sure the opposition’s casuals will hardly mention it!). However, they’re going to primary schools. I’ve helped judge a few kids art competitions so I know how random they can be (great laugh, mind you). I used to enjoy drawing my own football strips and badges from about the age of eight. It was mostly copying and changing colours so don’t think they would stand up now (although that retro Umbro look is coming back). I only really developed my own ideas later in secondary school. The Lord Lyon stuff makes it a tricky design brief for an adult let alone children. Hopefully there’s a child prodigy out there. I wanted to try and raise the profile and standard of design a wee bit. Not that I’m Peter Saville or that everyone loves my stuff (I’ve been on Facebook, I know they don’t!). However, I have an eye for detail. Club badges will always be more heart than head but a good design can update them and keep the history. Clubs are probably like most groups – they don’t give design much thought. All the more reason to reach out to the local creative community. Don’t know if that happened before they cracked out the crayons. I discovered late on Friday 24th February that it was the deadline for the competition that day (the closing date had been announced on Thursday 23rd). I had to make a snap decision about whether or not to enter. Not just my own design but also an adapted version of Graham L’s idea that I’d been working on (with his approval). For the record, I also encouraged Alistair Devlin to adapt and enter his roundel design as I think it’s the most innovative idea. In the end, I decided to email in the ‘open circle’ version (late on Friday). That design had a better overall reaction on Pie & Bovril’s Ayr thread. I originally did a version with a white surround. However, I prefer the black version as did most fans who commented (including someone who wanted it as a tattoo!). I think a black surround will work better on a white shirt. I also think it’s important the idea came from a fan originally. Since I’m not an Ayr supporter I thought entering my original idea wouldn’t be accepted. In design it’s sometimes called “kill your babies” – dropping ideas that won’t work, even if you like them. Sorry to people like Aaron and others who wanted me to enter my anchor design. I thought that part of Ayr’s history was too obscure. I still think it looks sharp and is a good design but it seemed a bit alien to some fans. I think the circular version stands a better chance as it’s more familiar. 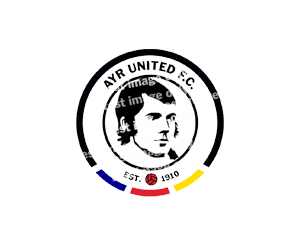 Ayr Utd announced a shortlist of all circular designs apparently approved in some form by the Lord Lyon. I’ve updated this page accordingly. A few of the above made the cut. My entry didn’t – it’s not clear if it missed the deadline or not. In any case, the club have since crowned the winning badge. Either way, part of me is relieved that I wasn’t involved in another club’s badge competition. One view could be that my design work was a waste of time. However, I’d stand by the above statement that the work has illustrated the issues (as they were from the Airdrie situation) and the webpages can act as a reference. It’s also experience for me that’s different to my day job. The main lesson is that football fans are incredibly hard to please! Ayr Racecourse image © Copyright william craig and licensed for reuse under this Creative Commons Licence. I am a big fan of your design that you previously made. I can also agree that it wouldn’t be wise to allow local children to design the club badge. 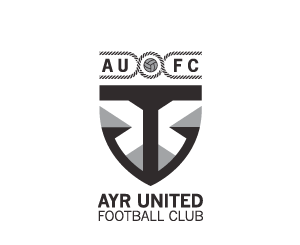 Although it may be a part of their history Ayr needs a logo designed by professionals to seem like an actual professional football club and not a village team in the Ayrshire league. Thanks, one thing I was going for with my design was something sharper that might make opposition fans a bit envious. However, I get that tradition and continuity is the most important thing for a lot of fans so it was trying to strike a balance.